In the 1930’s R.N. Elliott made what was, at the time, a revolutionary discovery: markets are of a fractal nature. A fractal is an object that displays self-similarity across all scales -- in this case, the patterns in a one-minute chart are smaller versions of the patterns in the hourly and daily charts, and so on. Elliott also discovered that these market fractals seem to follow many natural mathematical laws, such as the golden ratio (1:1.618) found throughout the natural world. Certain personalities find this outrageous: how could a stock market have anything to do with the golden ratio? Apparently they view man as being separate from nature, as opposed to being part of nature. I find Elliott's discovery to be not only believable, but painfully obvious. how could any market possibly operate outside of those laws? Man is forced to work within natural laws, and as a result, those laws impact our behavior in quantifiable ways. We all have an innate discomfort with heights -- because the law of gravity has impacted our psychology and altered our behavior (nobody jumps off a ten story building thinking it's a good idea). Nature's laws impact man's psyche, both consciously and subconsciously; and our psyche impacts our behaviors in all things, including markets. R.N. Elliott originally discovered the theory through his detailed back-study of decades of price charts. I’m going to simplify a bit, for the sake of time, but the essence of his discovery is that the market advances its position forward (note "forward," not "up" -- advancement is relative to what the market is trying to accomplish, either up or down) in five-wave moves: wave one forward, wave two back, wave three forward, wave four back, wave five forward. It then corrects that advance in three-wave moves in the opposite direction: A forward, B back, C forward. The moves that advance the market's larger trend are called "motive" waves, and the moves against the larger trend are "corrective" waves. As a result of the fractal nature of the market, R.N. Elliott was also able to determine certain rules which govern price movement. For example, wave 4 virtually never crosses into the territory of wave 1 (except during special patterns, which I won't be getting into here since this isn't intended to be a book). There are also rules which govern the length of waves (wave 3 is never the shortest), the form of corrections, and so on. Having concrete rules which govern price movement means that, at times, the market in essence "locks" itself into certain future behavior; once part of the fractal is formed, it must be completed. This affords a degree of predictive value. To draw an example, it is extremely rare to find an isolated five-wave sequence in the market. There are certain exceptions to this, but the majority of the time, one five-wave sequence will lead to at least one more five-wave sequence in the same direction. Thus, if one can locate the beginning and end of one five wave move, one knows to expect another similar move to follow (usually after an a-b-c correction). The fact that five wave moves virtually always occurs in the direction of the next larger trend also helps us locate the overall trend of the market. 1) The entire market is the pattern. There’s no waiting around all day for head and shoulders patterns to show up. 2) Elliott’s formulas allow one to calculate targets for many patterns which are not recognized or addressed in classical TA. 3) Elliott Wave provides an added degree of probability, and can often suggest what the market will do next -- and even suggest whether a more widely-recognized pattern will succeed or fail. To draw a real-life example of the 3nd point and advantages therein: long-time readers will recall the triangle pattern that formed in in October/November of 2011. Triangles are usually continuation patterns in classic TA, and the majority of technicians believed the triangle marked a consolidation of the October rally, and that it would ultimately break out higher. 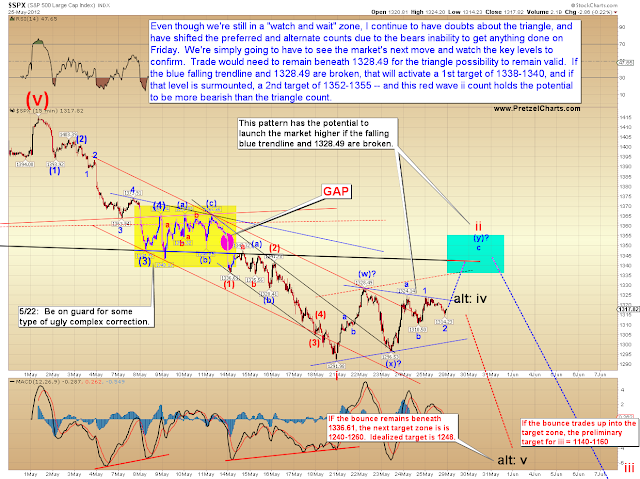 However, Elliott has specific rules for triangle patterns, and using the edge provided by Elliott Wave, I was able to correctly predict that the market would not break out from this pattern, but would instead break down and head lower (See November 17, 2011: SPX and BKX Update: Next Move Should Be Lower). I can say without shame that my longer-term projections in that article (SPX to low 1000’s) turned out to be a miss after the coordinated central bank intervention in late-November (known to bears as the Thanksgiving Day Massacre) – sometimes we simply can’t see that far down the road and anticipate every coming twist and turn. I believe to this day that had the central banks not intervened at that time, then the market would likely have reached my projections. Apparently, they believed it too – hence the intervention. As with most things worth knowing, of course, the devil is in the details. It takes time and practice to begin to accurately interpret the fractals. And even after years, there are moments when it’s difficult to get a bead on the market. 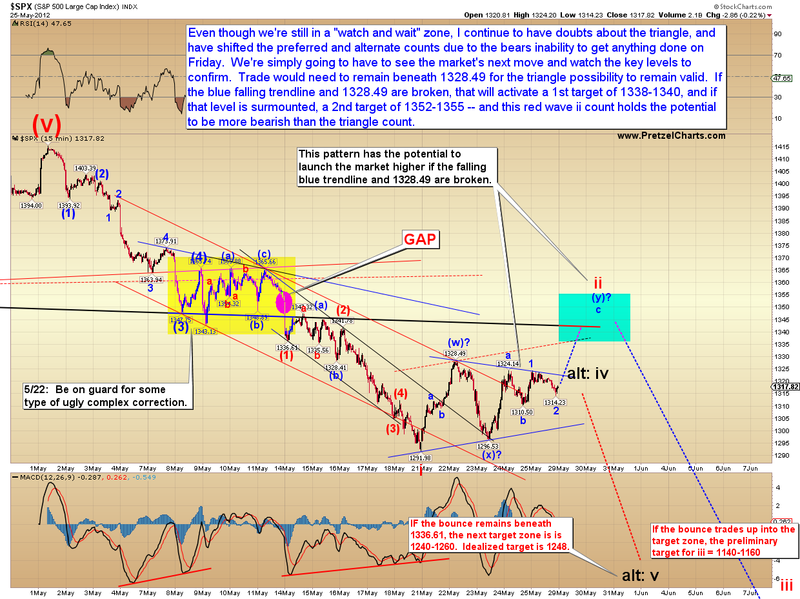 As a result, there is an “art” to Elliott Wave analysis that seems to come only with repeated study and practice. Some days, the market is simply indecipherable, even to the best technician – but the advantage provided during these times is that Elliott Wave allows us to examine and assign probabilities. This often results in analysis that takes the form of an If/Then equation. IF the market crosses X price point, THEN it is highly likely to reach the Y price point. I’m sure most traders do not need to be told the value of such equations – almost all classical technical analysis follows similar, albeit more basic, equations. I don’t use Elliott Wave as the end-all in my analysis, but it is definitely my analytical tool of choice. There are times it’s difficult to read the market, and times the market forces us into a “watch and wait” mode – no form of analysis can tell you with certainty what the market will do every second of every day. But over the years I’ve found -- at its best -- Elliott Wave Theory is almost magical in its ability to allow us a predictive glimpse into the market’s future. In a future installment, we'll discuss how to apply some of these concepts to real-life market events. Friday's light session actually did a bit toward solidifying my doubts that the potential "triangle" was not likely to be a true fourth wave triangle, and as such, I've flopped the preferred and alternate counts of Friday's update to relect what I feel is a marginally more likely interpretation. It's still a bit of a toss-up, though and the key level to watch remains 1328.49. Below that price point, and the triangle stays on the table. I also want to briefly discuss another pattern that's been knocking around in my skull for a while. I have always been bothered by the form of the decline that started at the end of March. Readers will recall me mentioning the RUT in comparison the the SPX on numerous occasions, and discussing how the RUT didn't quite reconcile as a five-wave decline. This opened up the possibility of a leading diagonal, and the market action recently has caused me to decide to mention this potential. This pattern shows quite well on the Russell 2000 (RUT). 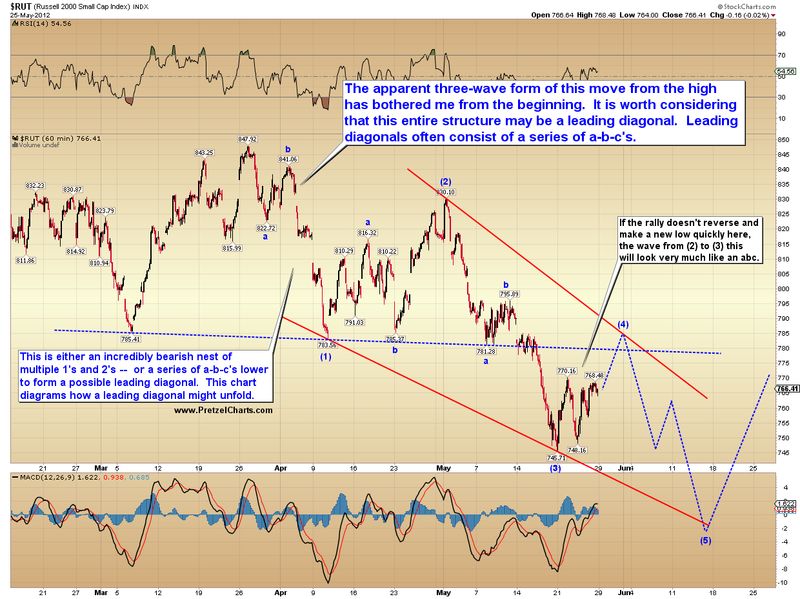 The short-term expectation would be the same in this pattern, a bit more rally, then a decline to new lows. We'll examine this more closely depending on how things develop in the next few sessions. 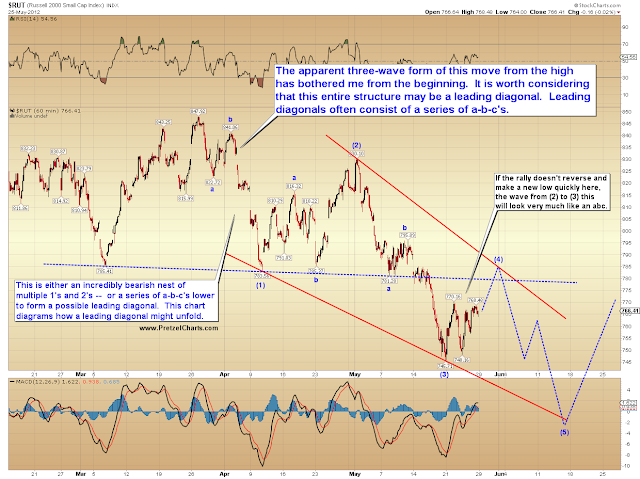 In conclusion, my expectation is still that the market will make new lows in the near term. What happens over the next few sessions could always cast doubt on that expectation, but at present I see nothing to alter that prognosis. Trade safe. Reprinted by permission; copyright 2012 Minyanville Media Inc.
Are the targets on a closing basis or intraday basis? Great work as always. One comment on your leading diagonal for the RUT -- unlike ending diagonals, LDs require 5-wave moves for the motive waves, just as in a regular 5-wave move. The corrections are of course 3-wave moves and 4 will overlap 1 and the 5th will show negative divergence to 3, which is how you can tell it's a LD vs. a 1-2, 1-2 setup.